Thanks for your visit to the IDEAS booth at the AOPA National Assembly in Seattle this September. Contact us at info@ideas-americas.com if you need more information! See IDEAS products at the Ken Hall stand at the Podiatry Manager's Conference 2009 at the Moat House Hotel in Stoke on Trent from 2 - 4 March! 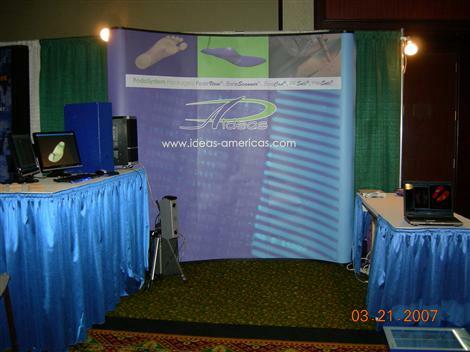 See IDEAS software for custom orthotics at the AAOP 2009 at the Atlanta Hilton at 255 Courtland Street, Downtown Atlanta from 4 to 7 March! See the IDEAS products on the Ken Hall stand from 27th - 29th March at the 2009 BAPO Conference in the Reebok Stadium in Bolton. Visit www.bapo.com for further information on the conference and the venue. Visit the Ken Hall stand at Foot Health 2009 on 23rd and 24th June at the Kettering Conference Centre to see IDEAS products!! Thanks for taking the time to stop by our booth at AOPA 2008. If you need anu further information, please send us a mail at info@ideas.be! Thank you for your visit to the Orthopädie + REHA Technik Fair in Leipzig. Don't hesitate to contact Leone on marketing@ideas.be if you need any further information! See you next time! Merci de nous avoir rendu visite aux journées de l'UPODEF le 28 et 29 mars à l'Hilton de Strasbourg. A très bientôt! 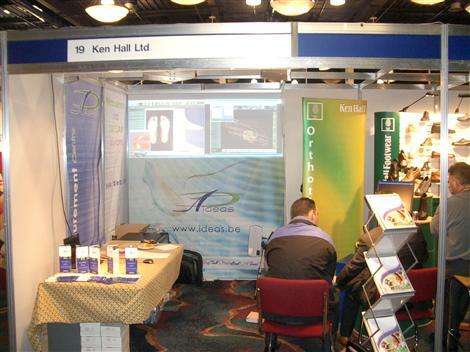 Thank you for your visit to the Ken Hall stand at the BAPO Conference 2008. Thank you for visiting us at the AAOP in Orlando from 27 February thru 1 March at the Caribe Royale Orlando Resort . We were delighted to demo our measurement and CAD/CAM products for the production of Orthotics! Don't hesitate to contact us if you have any further questions. If you were unable to visit us at one of the events listed above, we look forward to seeing you at other events throughout 2007 & 2008. Should you need any information before our next event or should you wish to organise a demonstration, please contact us! Thank you for your visit to IDEAS' booth at MEDICA in Düsseldorf this 14- 17 November. Thanks also to Brussels Export for their organisation and support for this event. Thank you for visiting IDEAS at the Belgian Sports Podiatry Conference at the Ramada Plaza Hotel in Antwerp on Saturday 27 October. 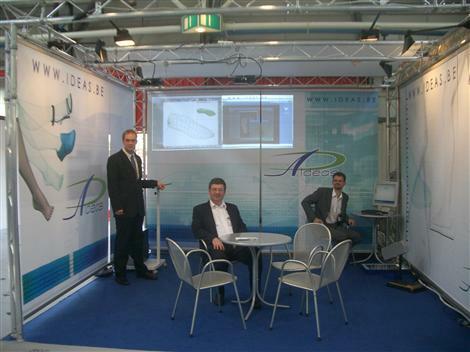 IDEAS exhibited its CAD/CAM systems for the easy production of functional and accomodative insoles. Merci pour votre visite aux 32ème Entretiens de la Podologie à Paris ce 19 et 20 octobre. Thank you for visiting us during this ISPO 2007 world congress. Thank you for visiting our booth at the FIP 2007 Congress in Copenhagen this May. Don't hesitate to contact us if you would like to come to one of our offices for a demo!